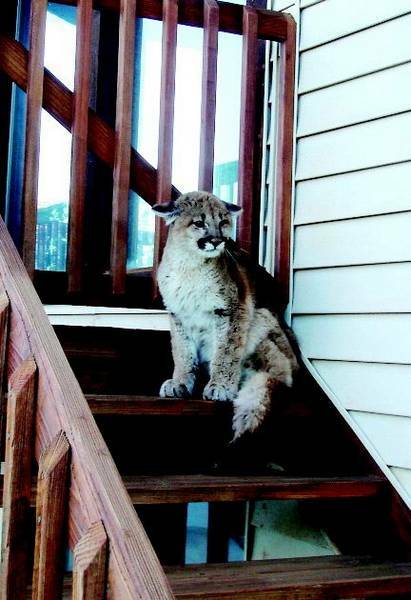 A young mountain lion sits on patio stairs Tuesday in the Dakota subdivision home of Mary Kenyon. Photo courtesy Mary Kenyon. Mary Kenyon loves living around wildlife in the Roaring Fork Valley, but an encounter with a mountain lion Tuesday was a little too close for her comfort.Kenyon was “half awake” while out on a walk with her two dogs shortly after dawn when one of her Labrador retrievers started barking. Kenyon looked around to see what her dog, Boo, was excited about and spotted a mountain lion crouching on the stairs to a deck on the outside of her house in the Dakota subdivision, just downvalley from Blue Lake.Boo wanted to play; the cat didn’t. The mountain lion hissed, wound up a paw in swatting position and bared “large fangs,” Kenyon said. Boo quickly got over her urge to play and Kenyon was able to grab her collar, pull her away and get both dogs inside. She estimated she was within 25 feet of the mountain lion when she grabbed Boo.It was one of several recent mountain lion sightings in the midvalley. Kenyon initially thought the mountain lion looked small but realized how big it was when it came down the deck stairs and hung out at a different site outside her home. “They’re beautiful animals,” she said.She called the Colorado Division of Wildlife and a couple of officers responded. The cat stayed put until the officers arrived, then it ran off into the woods in the hills above Dakota. Kenyon said she learned that even a small mountain lion should be avoided by humans.”Don’t treat them like a cat,” she said.Kelly Wood, the wildlife officer for the Basalt district, estimated the mountain lion, also known as a cougar, weighed about 30 pounds. It was probably a cub or yearling, she said.Mountain lion sightings in the midvalley are fairly common. Several sightings of adult cats have been reported in Missouri Heights this year, Wood said. The smaller cat has been reported a few times around Dakota and Blue Lake. The Division of Wildlife posted warnings in the El Jebel area that mountain lions have been spotted. “I don’t want people to go into hysteria about it,” Wood said.But she does advise people to keep their cats and dogs indoors so they don’t become tasty treats. Pets that live outdoors should be in enclosures.The wildlife division’s material on “living with mountain lions” also advises residents in areas where there have been sightings to closely supervise their children when they play outdoors, especially at dusk and dawn. Further tips on co-existing with the big cats are available at http://wildlife.state.co.us/education/LivingWithWildlife/LionCountry.asp. Mountain lions are attracted to the valley floor when snow drives deer out of the mountains to the lower elevations. Deer and rabbits are two of the main food sources for the big cats.